You can’t help but to unwind on the journey to Mindo as the road slowly unravels across the mountains. Leaving the concrete and crowds of Quito behind, the surprisingly good road curls its way up and down for a couple of hours before it drops deep down into the small town. Soft, humped-topped mountains march alongside with every square centimetre rammed with spectacular trees and shrubs. Hotels and hostels for the most part are tucked tantalisingly away inside this greenery, built sympathetically with their surroundings, and most with a large amount of space between them and their neighbours. 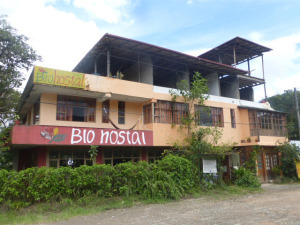 My hostel, the Bio Hostal, was located just one block back from the main square down an unpaved road. Walking down this road with my backpack I became aware of the peace and quiet of the place, with little traffic but resounding bird songs echoing around. 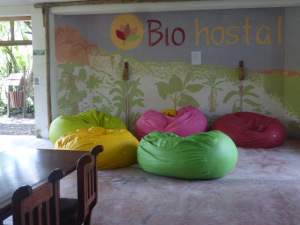 The Bio Hostal looked welcoming with its bright, airy dining area set out with colourful tablecloths and gigantic squooshy beanbags over in the corner. Whilst Paul was checking me in, Maria, the most delightful eleven year old came over to practice her very good English with me and Marcela her mum, who was sweeping, beckoned me over to the back door and pointed out two green parrots that were playing around in the large tree outside in the garden. My room was a good size and with two huge windows and it was nice and bright. It was basic but squeaky clean and it contained a double bed, a desk, a hand basin, a TV and some little wooden storage units. 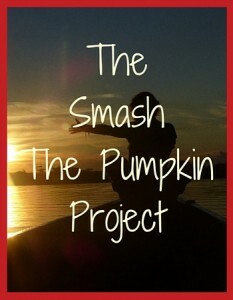 The bathroom was tidy with a three quarter-sized bath with a shower over it, decent towels and a basic toiletry pack. I also checked out the dorm which contained just five beds (two sets of bunks and a single) – these beds were much wider than your average bunk too and it was also very comfortable. There was some discolouration on the ceiling and the walls of my room BUT it was clear from the slightly different colours of paint that a war was being raged against the damp which was attempting to sneak in. 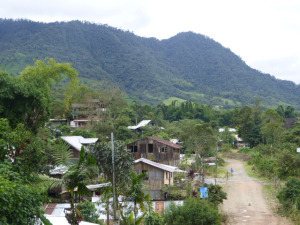 The amount of rain that falls every afternoon is quite something and whilst a lot of the buildings in the town could no doubt be made more modern, their rustic individualism only adds to the overall charm of Mindo. 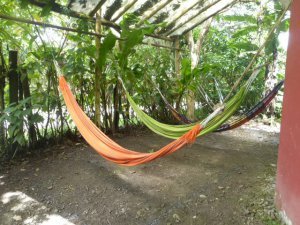 There are plenty of little nooks and crannies for you to sit and relax in at the Bio Hostal, and with lots of magazines and books to read, hammocks hanging and places to sit overlooking the garden with its bird life, it is just a nice place to be. Breakfast is included in the price and was ample. Fresh pineapple or melon juice, a plate of fresh fruits, scrambled egg, a tasty roll or toast and jams (or marmalade to use the Spanish) with coffee or tea – more than enough to set you up for the day hiking or visiting the many sites in this tiny town. So, what did I get up to in the Cloud Forest? Quite a lot actually and I shall cover the individual activities in another post, but the absolute highlight for me was an early morning bird watching walk. Now. I like birds and I can identify quite a few, but I am no expert. 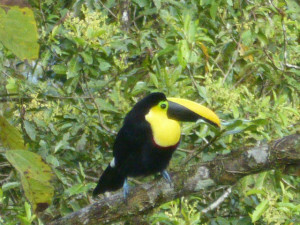 I really really want to see a typical multi-coloured sat in a tree whilst in South America, but when I found out that Mindo had toucans I was very disappointed not to find a guided tour that I could afford. And then I struck gold. A walk was going out the following day and from my hotel. The guide was none other than our hostel manager and he was already planning to take a small group of guests out and there was room for me an affordable price. Rising early, Irman Arias (do check out his link. He is one talented man) served us all breakfast and then, just as the dawn was breaking at six am we set off. 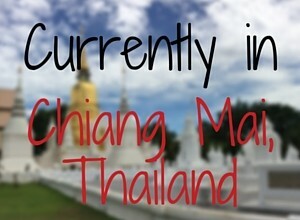 We trekked through the deserted town as the mist rose eerily up from the forest and the bird songs were shrill and clear. We walked for close on five hours and every so often Irman would stop and set up his tripod on the track and without fail, he would hone in on a bird or three. Through the telescope even the small brown birds became interesting and we all had been given binoculars to share around too. But then, all of a sudden – sat in clear view, though I doubt any of us would have spotted it without Irman was a dazzling yellow toucan. 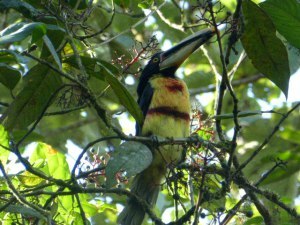 It posed for ages for us on its branch, and was soon followed further on in our walk by a small green one, the more traditional black and red one (as adopted by a brewery) and then playing for ages in the trees about our heads a trio of multi-coloured toucans. The toucans were the highlight for me but we also saw red, yellow, blue and white birds, humming birds and a swallow tailed kite. Irman walked along, gently calling and often being answered by various birds He knew all the names and exactly where to find most of them, having lived in Mindo all his life. 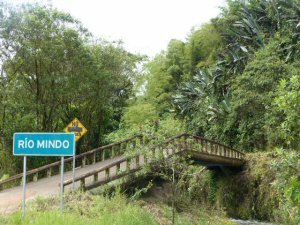 As well as the birds, Mindo can offer butterflies and frogs, good coffee shops, humming birds and orchids, tubing in the river and waterfalls, as well as zip lines through the canopies and miles and miles of spectacular walks or bike trails. Would I recommend Mindo and the BioCloud hostel? Yes – without a shadow of a doubt. 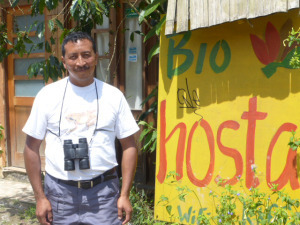 Irman is one of the best bird guides of Mindo and probably around Ecuador. He has several tours in the amazon forest and Western Andes.